TOKYO — While President Donald Trump waits in the wings, North Korean leader Kim Jong Un arrived in Beijing on Tuesday for his fourth summit with China’s Xi Jinping — yet another nod to the leader Kim most needs to court as he tries to undermine support for international sanctions while giving up little, if any, ground on denuclearization. Kim’s four-day visit comes after he expressed frustration in his annual New Year’s address over the lack of progress in negotiations with Washington since his unprecedented summit with Trump in Singapore seven months ago. If things don’t improve — meaning that if sanctions relief and security guarantees aren’t in the offing — Kim warned that Pyongyang might have to find “a new way” forward. The meeting with Xi could have a big impact on Trump’s efforts to get Kim to abandon his hard-won nuclear arsenal. He has said he expects to meet Kim again soon. But his own relationship with Xi is deteriorating amid an escalating tariff battle and his attentions are scattered over a wide array of domestic issues, including a big shift of power in Congress. Kim’s arrival in Beijing, on his birthday no less, underscores just how important China is, and always has been, in the North Korean leader’s eyes. That’s a well-known fact. But it’s often been lost in the glare of post-Singapore showboating. 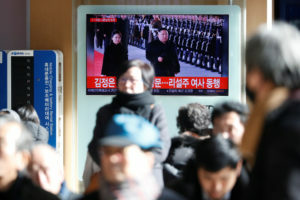 Until news of Kim’s departure for Beijing broke late Monday, attention outside of North Korea had been focused almost exclusively on when, or whether, he would be making his first and much-anticipated trip to Seoul. Then there was talk, fueled in large part by Trump himself, that another U.S.-North Korea summit was near and that officials were negotiating where it would take place. Vietnam’s capital, Hanoi, was reportedly on the short list. Kim’s first foray outside of North Korea as leader was for a summit with Xi last March. The two met again in May and June, just ahead of and just after Kim’s June 12 summit with Trump in Singapore. Going back even further, Kim reportedly traveled with his father, Kim Jong Il, to China in 2010. He assumed power after the death of his father the following year. Kim wants to get out from under sanctions, and Xi holds the key. China is far and away the North’s biggest and most important trade partner, supplying the country with everything from fuel to shrimp chips. Flights by the North’s national airline to China and the cross-border railway are among the North’s only regularly used links to the outside world and are absolutely crucial to its economic survival. Kim knows how vulnerable this makes him. But the growing trade frictions between Washington and Beijing also provide Kim with an opening. China has never been as supportive of sanctions as Washington. So it makes sense for Kim to try to persuade Xi to break with Trump’s policy of maintaining “maximum pressure” on the North until it denuclearizes. Ever since the Singapore summit, Pyongyang has hinted at a familiar fallback plan if talks with the U.S. fail. The North has claimed that while it has done all it could reasonably be expected to do, Washington has remained hostile and unbending. If Kim’s diplomatic outreach breaks down, Pyongyang will claim Washington is to blame and its sanctions are unjust. Laying the groundwork for that argument — and getting Xi’s advice — prior to a Trump summit could be one of the main objectives for his current visit. Kim’s statement about how he might have to choose a “new way” to guarantee the North’s sovereignty and secure a lasting peace on the Korean Peninsula caught the eye of many foreign analysts. Ruediger Frank, a professor of East Asian economy and society at the University of Vienna, suggested in a commentary for the respected 38 North website that it was the most important passage in the entire speech, reflecting an “almost exuberant” confidence in the growing and reliable support of China. North Korea has throughout its history been a master at playing the big powers off each other. But Kim and his predecessors have also always been wary of allowing China to get too much influence over their affairs. Because it is a more real possibility, the only nightmare scenario that frightens the North’s ruling regime more than the image invoked by Trump after the Singapore summit of American capitalist entrepreneurs descending on their country to rebuild its economy is the thought of a similar invasion by Chinese businessmen and investors. Confident or not, in dealing with Xi or Trump, Kim is still walking a fine line. Mattis is leaving. What does that mean for Trump? North Korea’s Kim promises ‘denuclearization,’ but where does diplomacy stand?